Edward Bouverie was born to a family of wealth and influence whose father took the surname "Pusey" when he moved into the manorial estates of the village of Pusey in England. Edward was a good student at Eton College, and later the University of Göttingen, but had trouble making and keeping friends. It seemed, regularly, that his nose was so deeply buried in his studies that he failed to cultivate some of the social skills that his colleagues had. He was appointed a fellow at Oriel College even while he continued studying theology. Though he struggled with friends and to make himself understood--even so far as to make the German Pietists he tended to agree with think that he disagreed strongly with them--he was a gifted teacher. He received an occasional opportunity to preach once he was appointed to teach Hebrew at Oxford. Only two years after his wife died, he preached a significant sermon at Oxford entitled, "The Holy Eucharist, a Comfort to the Penitent." This sermon had an incredible impact upon the hearers not because Edward was a gifted orator--he was an enthusiastic but generally mediocre speaker--but because it affirmed traditional church teachings to a modern society consumed with itself. By reaching back in time to expose the current Church to the historic Church, Edward forced the audience to deal with a strong witness from a communion of saints that transcends time and the grave. After preaching, he was suspended for preaching for over two years but this suspension created a wave of publicity that meant selling more than 15,000 copies of the sermon to interested parties. Edward's challenging message spread out and further projected his voice into the world of the Church. Edward continually challenged the Church that was with the historic Church. 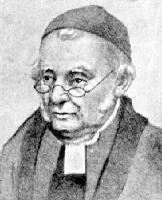 For him, that meant confronting other Anglicans with their disconnect from other manifestations of the Church andcalling upon the Church to be united.Pusey remained within the bounds of the Anglican church while persistently driving backwards to the communal holdings of the Church Universal. He continued to write about the Eucharist--that which brings all Christians into communion regardless of geography, time period, or theology--and about ecumenical questions. The man who struggled to make and keep friends spent his life pushing himself and others to join closer in communion. Though he indubitably had frustration with the Church he was working to reform, he maintained a loving relationship with the very same institution that caused his anxiety and frustration. He died in 1882, two years after he watched his own son--an academic like his father--die. Though he did not live an easy life, he lived a life of reformation of and devotion to the Church that had formed him and loved him even when he was misunderstood and disagreeable.